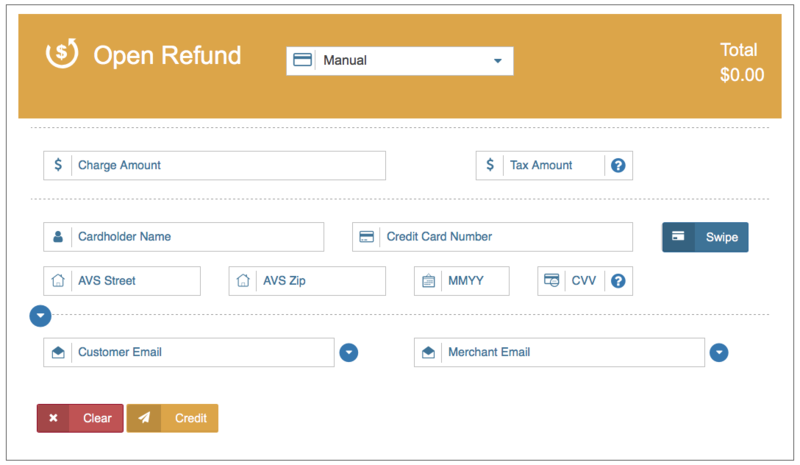 The Refund page of the merchant console allows you to return funds to a customer's credit card. A transaction can only be refunded if it has settled. If the transaction has not settled, the transaction must be voided. This page gives you three options: refund a transaction, void a transaction, or view transaction details. Search or scroll down to the transaction you would like to refund. Search for the specific transaction by entering the Cardholder’s name, Transaction ID number, Auth Code or by swiping the credit card you wish to issue a refund to. Click 'Refund' to credit the transaction. A pop up window will appear. In the pop up window, click 'Refund' again to confirm the transaction. If you are unable to find the transaction from entering the Cardholder’s name, Transaction ID number, Auth Code, you may issue an Open Refund. 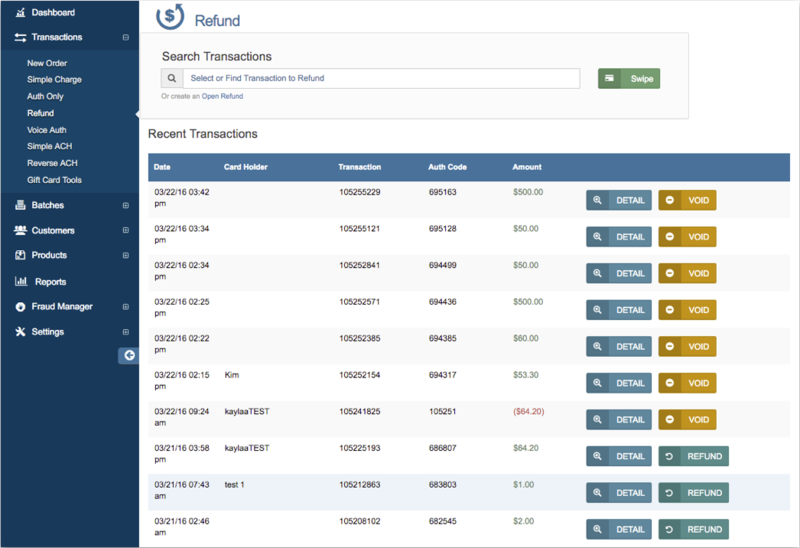 Click on the ‘Open Refund’ link below the ‘Search Transactions’ field. You will be taken to the Open Refund page. You may manually enter the customer’s credit card information or swipe their credit card. When manually entering the customer's credit card information, the 'Amount', 'Credit Card Number' and 'Expiration Date' fields are required. The Cardholder Name, Tax Amount, AVS Street, AVS Zip Code, and CVV fields are all optional. To swipe the customer’s credit card, click 'Swipe'. Once you click 'Swipe', the ‘Please Swipe' window will appear. Swipe the customer’s credit when prompted. Once you have swiped the card, the customer’s encrypted credit card information will auto-populate in the following fields: Cardholder Name, Card Number, and Expiration Date. To reveal additional fields (Company Name, Customer ID #, Invoice #, PO #, Order ID, and Description), click the drop down arrow on the top left side of the 'Customer Email' field. To email the receipt to your customer, enter the customer's email in the 'Customer Email' field. To send a report of the transaction to your own email, enter your email in the 'Merchant Email' field. Once all desired fields have been entered, click 'Credit'. A pop up window will appear with one of the three responses: 'Transaction Approved', 'Transaction Declined', and 'Error'. A void nullifies or cancels a transaction. A transaction can only be voided if a batch has not been closed or settled. To void a transaction, click ‘Transactions’ on the side menu bar. A drop down menu will appear, click on ‘Refund’. Once you’ve clicked ‘Refund’ you will be taken to a page where you can see your recent transactions. Click 'Void' on the transaction you want to void. A pop up window will appear (with the transaction number) to confirm the void. 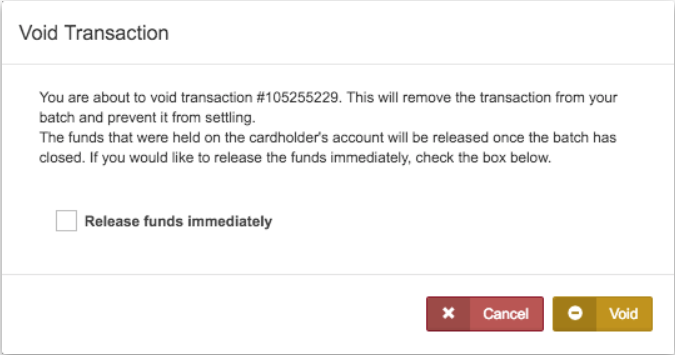 Check the ‘Release funds immediately’ box to return the funds to the customer immediately then click 'Void.' A pop up window will appear with one of the two responses: 'Transaction Approved’ or ‘Error'. Please Note: The ‘Release funds immediately’ box will be available depending on your processor.